America’s thriving economy is showing the rest of the world that capitalism remains the most effective economic system known to man. The U.S. stock market just posted its biggest quarterly gains in a decade, as investors were comforted by the appointment of Trump ally Stephen Moore to the Federal Reserve’s Board of Governors. Moore is a tax-cutter who helped write President Trump’s broadly successful tax reform, and he’s expected to resist calls for the Fed to raise interest rates while the economy continues its recovery from the Great Recession. This news contrasted with continued global weakness, including disappointing reports on manufacturing in Asia and Europe. In Germany, declining exports have coincided with an economic slowdown in China, which is Germany’s largest trading partner. Meanwhile, Brexit difficulties continue to paralyze the U.K., and the French are still rebelling over President Emmanuel Macron’s unforgivable socialist tax hikes. Further depressing the global economy is the lack of growth in Japan, due to weakness in exports and lackluster economic recovery. Yet, while manufacturing is contracting elsewhere, it continues to expand in the U.S. The Institute for Supply Management’s index of national factory activity surged to 55.3 in March, an increase of 1.1 over February, and nearly a full point higher than economists had predicted. Americans continue to enjoy historically low unemployment across all socioeconomic levels, so much so that other countries are now attempting to revive their own economies with bold, effective, Trumpian corporate tax reductions. And when Americans are working, their outlook improves. A recent CNN poll found that 71 percent of respondents say the U.S. economy is solid, which is the highest level of economic optimism in 18 years. 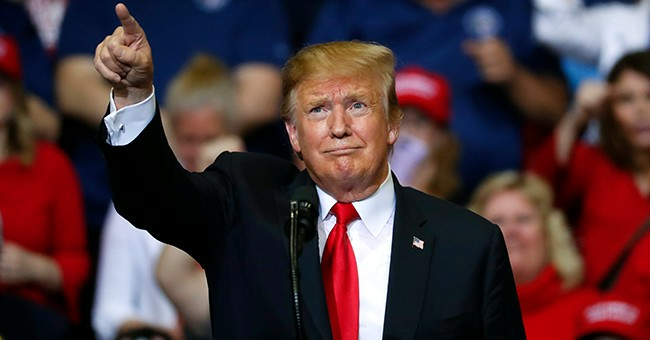 Most of those surveyed approve of President Trump’s economic policies and the poll showed his approval rating has climbed to 42 percent as Americans realize that his capitalist policies are working for them. In fact, America is one of the only industrialized countries that continues to enjoy strong growth thanks to President Trump’s commitment to deregulation and adherence to free-market policies. It’s good news for the Trump economy too that the Fed announced that it will forestall planned interest rate hikes in the near future, removing a major source of economic uncertainty. Plus, Steve Moore’s appointment to the Fed will further solidify support for an accommodative monetary policy that works in tandem with the President’s pro-growth policies. Going forward, investors are optimistic that President Trump will continue to push back on socialist policies while giving capitalism the freedom to flourish. It also appears that a trade deal with China is forthcoming, as evidenced by Treasury Secretary Steve Mnuchin’smeeting in China, giving investors further cause for optimism. Less than three years ago, China was pirating U.S. inventions without limit; now we’re on the verge of a historic agreement to open up China’s markets to free, fair, and reciprocal competition. President Trump has been an unwavering champion of capitalism in the White House, and the effectiveness of his pro-growth agenda is showing that capitalism is still the surest route to prosperity.